2001 DHC Dongshin Hydraulics Co. “DIMA” mdl. A00713 250-Ton CNC Plastic Injection Molding Machine w/ Barber-Coleman / Eurotherm CNC Controls, 22.4oz Shot Size, 32 ½” x 30” Die Space, 22” x 19 ½” Between Posts, Mole Thickness 21.65” Max / 9.06” Min, Hyundai Electric Hopper Dryer, IMS Vacuum Loader. 1997 Woojin SELEX E165 mdl. UNIMAX 165 165-Ton CNC Plastic Injection Molding Machine s/n 9704232 w/ Woojin CNC Controls, 10oz Shot Size,29 ¾” x 28” Die Space, 19” x 17” Between Posts, Hyundai Electric Hopper Dryer, Conair Timed Cycle Color Feeder / Hopper. 1995 Woojin SELEX E165 mdl. UNIMAX 165 165-Ton CNC Plastic Injection Molding Machine s/n 0803951 w/ Woojin CNC Controls, 10oz Shot Size,29 ¾” x 28” Die Space, 19” x 17” Between Posts, Hyundai Electric Hopper Dryer, Conair Timed Cycle Color Feeder / Hopper. 1995 Woojin SELEX E165 mdl. UNIMAX 165 165-Ton CNC Plastic Injection Molding Machine s/n 0301951w/ Woojin ES-250 CNC Controls, 10oz Shot Size,29 ¾” x 28” Die Space, 19” x 17” Between Posts, Hyundai Electric Hopper Dryer, Conair Timed Cycle Color Feeder / Hopper, IMS Vacuum Loader. 1997 Woojin SELEX 130 mdl. UNIMAX 120 132-Ton CNC Plastic Injection Molding Machine s/n 9704281 w/ Woojin CNC Controls, 8oz Shot Size, 26” x 25” Die Space, 13” x 11 ¾” Between Posts, Woojin Hopper Dryer. 1998 Woojin SELEX E95 mdl. UNIMAX 95 104-Ton CNC Plastic Injection Molding Machine s/n 98080130 w/ Woojin CNC Controls, 6oz Shot Size, 21 ½” x 21” Die Space, 13” x 11 ¾” Between Posts, Hopper. 1999 Woojin SELEX S95 mdl. 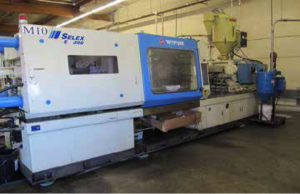 SELEX95 95-Ton CNC Plastic Injection Molding Machine s/n 9910181349 w/Gefran CNC Controls, 22 ¼” x 21” Die Space, 13” x 11 ¾” Between Posts, Hyundai Electric Hopper Dryer. Ganesh GT-1640S 16” x 40” Geared Head Gap Bed Lathe s/n S9305-013 w/ Newall C80 Programmable DRO, 30-2000 RPM, Inch/mm Threading, Tailstock, Steady and Follow Rests, KDK Tool Post, 5C Collet Closer, 8” 3-Jaw Chuck, 10” 4-Jaw Chuck. Ganesh “Deluxe GMV-3” mdl. KR-V2500 Vertical Mill s/n 11277 w/ Sargon DRO, 3Hp Motor, 60-4200 Dial Change RPM, Chrome Box Ways, Power Feed, 10” x 54” Table. 2000 Ganesh “Deluxe GMV-2” Vertical Mill s/n 11688 w/ Sargon 3-Axis DRO, 3Hp Motor, 60-4200 Dial Change RPM, Chrome Ways, Power Feed, 9” x 49” Table. Falcon Chevalier FSG-618M 6” x 18” Surface Grinder w/ Magnetic Chuck. Ramco mdl. RP-50 50-Ton Hydraulic H-Frame Press s/n 8990. Central Machinery 14” Wood Cutting Vertical Band Saw. K.F. Systems mdl. KF-1000 6” x 6” Shi Stamping Machine w/ Stand. (2) 5Hp Horizontal Air Compressors. Suburban 4” 3-Jaw Spin Chuck. Suburban 6” x 6” Magnetic Chuck. 5” x 6” and 6” x 6” Sine Tables. 5C Indexing and Spin Fixtures. Jones & Lampson mdl. PC-14 14” Floor Model Optical Comparator. Mitutoyo 18” and 12” Dial Height Gages. Etalon 12” Digital Height Gage. (2) Mojave 36” x 48” x 6” Granite Surface Plates. 36” x 36” x 6 ½” Granite Surface Plate. Microflat 24” x 48” x 4” Granite Surface Plate w/ Roll Stand. Starrett Crystal Pink 18” x 24” x 4 ½” Granite Surface Plate. Clark SP-30 3000 Lb Cap Electric Pallet Mover s/n SP246-0697- 6550 w/ 127” Lift Height, Magnum 3600 Digital Scale, Charger. Economy 750 Lb Cap Die Lift. (20) Sections of Pallet Racking. Polymer Machinery mdl. 912 SILENATOR “Double Angle Cut” Plastics Granulator s/n 912SIL10979. (2) Ball &amp; Jewell mdl. CG-812- SCSX Plastics Granulators s/n’s 5208-84045, 3393-43438. Ball &amp; Jewell mdl. CG-812- SCS Plastics Granulator s/n 4354-57360. IMS mdl. 2120-SC Plastics Granulator s/n 251200240. (2) Dai Han Electric mdl. DHL-200 Plastics Granulators w/ 245mm x 295mm 9.6” x 11.6”) Cutter House Opening. Novatec mdl. MD-25 Hopper Dryer s/n MD-25- 138. Pressor mdl. P-16N Pneumatic Trim Press.